KENNEDY, John Fitzgerald, (brother of Edward M. Kennedy and Robert F. Kennedy, grandson of John Francis Fitzgerald, and uncle of Joseph Patrick Kennedy II and Patrick J. Kennedy), a Representative and a Senator from Massachusetts and 35th President of the United States; born in Brookline, Norfolk County, Mass., May 29, 1917; attended the public and private schools of Brookline, Mass., Choate School, Wallingford, Conn., the London School of Economics at London, England, and Princeton University; graduated from Harvard University in 1940; attended Stanford University School of Business; during the Second World War served as a lieutenant in the United States Navy 1941-1945; PT boat commander in the South Pacific; author and newspaper correspondent; elected as a Democrat to the Eightieth, Eighty-first, and Eighty-second Congresses (January 3, 1947-January 3, 1953); did not seek renomination in 1952; elected to the United States Senate in 1952; reelected in 1958 and served from January 3, 1953 to December 22, 1960, when he resigned to become President of the United States; chairman, Special Committee on the Senate Reception Room (Eighty-fourth and Eighty-fifth Congresses); unsuccessfully sought the Democratic vice presidential nomination in 1956; elected thirty-fifth President of the United States in 1960, and was inaugurated on January 20, 1961; died in Dallas, Tex., November 22, 1963, from the effects of an assassin's bullet; remains returned to Washington, D.C.; lay in state in the Rotunda of the U.S. Capitol, November 24-25, 1963; interment in Arlington National Cemetery, Arlington, Va.; posthumously awarded the Presidential Medal of Freedom on December 6, 1993. Papers: JFK Assassination Collections. The JFK Materials collection began in 2004 with the acquisition of the papers of Penn Jones, Jr. These papers included correspondence, manuscripts, cassette tapes, video tapes, magazines, photographs and various publications. Additional materials were given by Penn Jones' sons including a large group of materials related to Penn's service with the 36th Infantry Division in WWII. www.baylor.edu/lib/poage/jones/. Other collections include Jack White and Gary Shaw collections and many others including 40+ JFK assassination research newsletter titles with over 800 individual issues, 420 magazine articles, 200+ videos, 100+ cassettes, HSCOAvideos and cassettes, correspondence from hundreds of individuals, general magazines, newspapers and videos documenting the life and death of President Kennedy. Additional collections from H. C. Nash, John Kelin, Chris Pike, Bob Platt, Doug Weldon, and Jack Hightower, as well as local Waco residents Larry Breen, Don Grisham and Joan Jasek. Finding aids available at www.baylor.edu/lib/poage/jfk/. Oral History: 1972-1978. 443 leaves. Discussed in a series of interviews in preparation for a biography: Eleanor Dulles, 32 pages; Deirdre Henderson, 71 pages, permission required; John Hersey, 24 pages; Hubert H. Humphrey, 21 pages; John Johansen, 21 pages, permission required; Lawrence O'Brien, 43 pages; David F. Powers, 55 pages; James A. Rousmaniere, 34 pages; Seymour St. John, 23 pages; R. Sargent Shriver, 44 pages, permission required; Theodore Sorenson, 56 pages, permission required; and Frank Thompson, Jr. 19 pages. Permission required to cite, quote, and reproduce. Papers: Correspondence in Grenville Clark papers, 1899-1972, written permission required; draft of "For John F. Kennedy," his inauguration, in Robert Frost notebook, 1961; and typescript poem by Robert Frost, "Dedication" with notations, read at President Kennedy's inauguration, 1961. Papers: Ca. 1961-1979. Ca. 50 feet. Kennedy assassination collections. Includes Federal Bureau of Investigation files (photocopies), papers and photographs relating to New Orleans District Attorney Jim Garrison's investigations (1967-1968), papers relating to photographic evidence, copy of the Zapruder film, and ballistics analysis. Finding aid. Papers: 1947-1960. 430 feet. Pre-presidential papers (1946-1961), including files from his service in the U.S. House of Representatives and Senate, campaign files, and presidential transition files. Portions available on microfilm. Also papers relating to his early years, presidency (1961-1963, 3,454 linear feet), and assassination. Include Jacqueline Kennedy Onassis papers, 1963-1968 (bulk 1964) (closed); Rose Fitzgerald Kennedy papers, 1896-1975 (closed); Joseph P. Kennedy papers, 1920-1969 (closed); Robert F. Kennedy pre-administration papers, 1937-1968, and attorney general papers, 1961-1964; Edward Moore Kennedy papers, 1960-1987; White House central files, 1961-1963; Miscellaneous presidential files, 1961-1963; social files, 1961-1963; Office of Congressional Relations files, 1961-1963; National Security files, 1961-1963; president's office files, 1961-1963. Finding aid. Additional Papers: In White House staff files of McGeorge Bundy, 1961-1963, 1963-1987 (bulk 1963-1965); Chester Clifton, 1961-1963; Barbara Coleman, 1959-1968; Dorothy Davies, 1961-1963; Ralph Dugan, 1955-1963; Meyer Feldman, 1961-1964; Seymour Edwin Harris, 1954-1961; William J. Hartigan, 1961-1968; August Heckscher, 1962-1963; Christian Archibald Herter, 1962-1967; Frederick L. Holborn, 1961-1963; Charles Horsky, 1961-1965; James McCauley Landis, 1960-1961; Dean Markham, 1962-1965; Godfrey McHugh, 1961-1964; Kay O'Donnell, 1961-1963 (closed); Kenneth P. O'Donnell, 1962-1963, 1948-1975 (closed); George D. O'Gorman, 1961-1963; Timothy J. Reardon, 1960-1963; Walt Whitman Rostow, 1961; Pierre Salinger, 1960-1964; Janet Travell, 1959-1964; Stafford Warren, 1961-1963; Lee White, 1961-1963; Henry Hall Wilson, 1961-1962; Joseph E. Winslow, 1961-1963; and Harris Wofford, 1960 1962 (closed). Also materials in John Barriere papers, 1960; K. Lemoyne Billings correspondence, 1937-1939 (closed); Jerry Bruno papers, 1958-1971 (bulk 1960-1968); William A. Dunfrey papers, 1952-1968 (access restricted); Ralph A. Dungan papers, 1961-1977 (closed); Robert H. Estabrook papers, 1956-1969; James Fahey papers, 1892-1968; Lincoln Gordon papers, 1936-1970; David Hackett papers, 1960-1968; Deirdre Henderson papers, 1959-1961; Arthur Norman Holcombe papers, 1952-1961; Chet Huntley papers, 1963; Montague Kern papers, 1961-1969 (closed); Herbert Klotz papers, 1952-1963; Richard E. Neustadt papers, 1949-1972; Dorothy Gertrude O'Brien papers, 1959-1960, on 1 microfilm reel; Lawrence F. O'Brien papers, 1960-1972 (closed); David F. Powers papers, 1945-1963; Matthew A. Reese papers, 1960-1978 (closed); Stephen E. Smith papers, 1963 (closed); Charles J. Stewart papers, 1963; John S. Stillman papers, 1960-1968 (closed); David H. Stowe papers, 1960; Jerome B. Wiesner papers, 1961-1973 (closed); and Robert Coldwell Wood papers, 1960-1977. Oral History: 1988. 110 pages. Interviews concerning Kennedy's call to M.L. King, with Louis Maartin, Parren Mitchell, Sam Proctor, R. Sargent Shriver, Franklin Williams, and Harris Wofford. Adler, Bill, ed. The Kennedy Wit. New York: Citadel Press, 1964. ___, ed. More Kennedy Wit. New York: Bantam Press, 1965. Brogan, Hugh. Kennedy. New York: Longman, 1996. Burns, James MacGregor. John Kennedy: A Political Profile. New York: Harcourt, Brace & World, 1961. Crown, James Tracy. The Kennedy Literature: A Bibliographical Essay on John F. Kennedy. New York: New York University Press, 1968. Dallek, Robert. An Unfinished Life: John F. Kennedy, 1917-1963. Boston: Little Brown Co., 2003. Dollen, Charles. John F. Kennedy, American. Boston: St. Paul Editions, 1965. Giglio, James N., comp. John F. Kennedy: A Bibliogaphy. Westport, CT: Greenwood Press, 1995. Goldman, Alex J., ed. The Quotable Kennedy. New York: Citadel Press, 1965. Kennedy, John F. "Congressional Lobbies: A Chronic Problem Re-examined." Georgetown Law Journal 45 (Summer 1957): 535-67. ___. A Nation of Immigrants. 1959. Rev. and enlarged ed., with introduction by Robert F. Kennedy and new preface by John P. Roche. New York: Harper & Row, 1986. ___. Prelude to Leadership: The European Diary of John F. Kennedy, Summer 1945. Washington: Regnery Publishing, 1995. ___. Profiles in Courage. 1956. Memorial ed. New York: Harper & Row, 1964. ___. Why England Slept. 1940. Reprint. Westport, CT: Greenwood Press, 1981. ___, ed. As We Remember Joe. Cambridge, MA: Privately published, 1945. Lemke, William Edgar. "The Political Thought of John F. Kennedy: To the Inaugural Address." Ph.D. dissertation, University of Maine, 1973. Lincoln, Evelyn. My Twelve Years with John F. Kennedy. New York: D. McKay Co., 1965. Lowe, Jacques. Portrait: The Emergence of John F. Kennedy. New York: McGraw Hill, 1961. Nevins, Allan, ed. The Strategy of Peace. New York: Harper & Row, 1960. Newcomb, Joan I., comp. 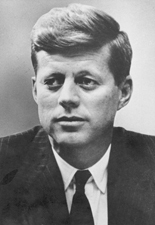 John F. Kennedy: An Annotated Bibliography. Metuchen, NJ: Scarecrow Press, 1977. Nurse, Ronald Joseph. "America Must Not Sleep: The Development of John F. Kennedy's Foreign Policy Attitudes, 1947-1960." Ph.D. dissertation, Michigan State University, 1971. O'Donnell, Kenneth P., and David F. Powers. "Johnny, We Hardly Knew Ye": Memories of John Fitzgerald Kennedy. Boston: Little, Brown & Co., 1972. O'Hara, William T., ed. John F. Kennedy on Education. New York: Teachers College Press, Columbia University, 1966. Parmet, Herbert S. Jack: The Struggles of John F. Kennedy. New York: Dial Press, 1980. ___. JFK: The Presidency of John F. Kennedy. New York: Dial Press, 1983. Rorabaugh, W.J. Kennedy and the Promise of the Sixties. New York: Cambridge University Press, 2002. Ryan, Dorothy, and Louis J. Ryan, comps. The Kennedy Family of Massachusetts: A Bibliography. Westport, CT: Greenwood Press, 1981. Sable, Martin H. A Bio-Bibliography of the Kennedy Family. Metuchen, NJ: Scarecrow Press, 1969. Sanghvi, Ramesh. John F. Kennedy: A Political Biography. Bombay: Perennial Press, 1961. Shaw, John. JFK in the Senate: Pathway to the Presidency. New York City: Palgrave Macmillan, 2013. Sorensen, Theodore C. Kennedy. 1965. Reprint, with new introduction. New York: Perennial Library, 1988. ___. The Kennedy Legacy. 1969. Special ed. New York: Macmillan Co., 1993. ___, comp. "Let the Word Go Forth": The Speeches, Statements, and Writings of John F. Kennedy. New York: Dell Publishing, 1991. Stone, Ralph A., ed. John F. Kennedy, 1917-1963: Chronology--Documents--Bibliographical Aids. Dobbs Ferry, NY: Oceana Publications, 1971. U.S. Congress. Memorial Addresses in the Congress of the United States and Tributes in Eulogy of John Fitzgerald Kennedy, Late a President of the United States. 88th Cong., 2d sess., 1964. Washington: Government Printing Office, 1964. Whalen, Thomas J. Kennedy Versus Lodge: The 1952 Massachusetts Senate Race. Boston: Northeastern University Press, 2000. White, Theodore H. The Making of the President, 1960. 1961. Reprint. New York: Atheneum, 1988. Wicker, Tom. JFK and LBJ: The Influence of Personality Upon Politics. New York: William Morrow & Co., 1968. Wszelaki, Jan H., ed. John F. Kennedy and Poland: Selection of Documents, 1948-1963. New York: Polish Institute of Arts and Sciences in America, 1964.